It was a gorgeous day in the never-to-be-forgotten spring of 2011, and I was cycling around that part of Norfolk between the River Bure and the River Thurne. All east Norfolk is carved up by its rivers, but this particular area, the Flegg, really was an island once, at the mouth of several rivers as they emptied into the wide North Sea. Intriguingly, most of the placenames on the Flegg are Norse in origin rather than English, an unusual phenomenon in East Anglia. Runham is an exception, but it is pressed against the river by the parishes of Stokesby, Thrigby, Filby and Mautby. It is easy to imagine a small settlement of Saxons clinging on to the south side of an island dominated by Vikings. As a stout-hearted Saxon myself, I like to think of them bravely living peaceful lives, farming and fishing in their quiet way, telling their stories at night and not living too much in fear of the neighbours from hell. Despite our proximity to the sea, this is rolling countryside, and it was a pleasure to cycle the ups and downs along narrow lanes. Off the road from Stokesby, a line of four deer cropped the young shoots in a corrugated field. A hare burst for cover as I passed, but I didn't seem to worry the deer too much. The hedges disappeared, and I was on a rising plain which must be a windy place on most days of the year. The tower of Runham church with its rabbit ears appeared among the trees beyond the fields. The building is mainly of the 14th Century, and it seems very large in this land of small churches. If it looks familiar to you, and you are of a certain age, there may be a reason for this. Back in the early 1970s, it achieved what Andy Warhol would most certainly have called its fifteen minutes of fame. I remembered it now. Humour is often a matter of personal taste, of course - for myself, I cannot see anyone trying to get up a hill on a bicycle with rear suspension without grinning madly, and I also find fat car drivers smoking furiously whilst stuck in traffic jams uncommonly funny. I realise this tells you rather more about me than you may want to know, but I reveal these things in order to contrast them with others which seem to touch the funny bone in almost all of us. Back in the 1970s, when there were only three television channels and not a lot else to do in the evenings, television programmes often used to achieve extraordinary audiences, hardly ever repeated nowadays. For example, the BBC television comedy series Some Mothers do 'ave 'em, which ran from 1973 to 1978, regularly achieved audiences of approaching twenty million people, despite having two apostrophes in its name. The episode which achieved the biggest audience was the Christmas special of 1974, in which the hapless Frank Spencer's co-star was, oddly enough, Runham church. The episode revolved around Frank's participation in the parish nativity play, and Runham church stood in for what was intended as an urban Catholic church. The climax of the episode involved Frank bursting through the chancel roof dressed as an angel, and being carried off by a helicopter. We knew how to laugh in those days. Inside Runham church there is a display which includes a copy of the original BBC contract, which specifies the making of a hole in the chancel roof and the mending of it afterwards. You may well wonder how a parish church could allow such damage without it interrupting the daily round of its mission, but the truth is simply that by 1974 this church had fallen into disuse, and was fast becoming derelict. It was never formally declared redundant, which is just as well, because if it had it would almost certainly have been converted into holiday cottages. When Pevsner's revising editor Bill Wilson came this way in the early 1990s, he found the church derelict and boarded up, and didn't go inside. Repeated restorations had, he thought, hardened the appearance, but it was the 1877 restoration by Ewan Christian which really did for this building, creating a mundane severity. Wilson would have known that Christian was Pevsner's particular bête noire, and so perhaps his comment is a kindness. In any case, the irony of thirty years of dereliction is that the crispness of Christian's work has been mellowed somewhat. The spectacular tower top with its pinnacles was the work of the Great Yarmouth architect JT Bottle, who was also responsible for the extraordinary gothick fantasy of Great Yarmouth St John, as well as the fine methodist church at Gorleston. During the time of dereliction, one of these pinnacles fell. Work had in fact started on repairing the church just before Bill Wilson's visit, but the fall of the pinnacle indicated quite what a parlous state the building had got itself into, and so the church was boarded up and a security fence put around it. Not for another ten years or so, by which time grant aid had become more plentiful, would local people roll up their sleeves and make their real attempt to drag Runham church kicking and screaming back into use again. Of course, there were many differences between the Britain of 1974 and the Britain of 2004. Primarily, of course, we had become, perhaps briefly, a rich country, and could afford the luxury of maintaining our priceless heritage more than we could thirty years previously. Additionally, a vast heritage industry had grown up in that time; people had become obsessed with the past, and historically themed villages and electronically enhanced 'experiences' catered for their hunger. By the start of the 21st Century, there was nothing we liked so much as a wander through a Viking town, or to watch a medieval cobbler at work, or various troops of the Civil War beating seven shades out of each other. But there was also an increasing hunger for a sense of the numinous; people were searching for something that they hadn't seemed to want thirty years before. Sometimes this was satisfied by New Age mysticism, but the Churches still had a lot to offer - by 2004, the Church of England seemed to have at last begun to grasp that most people don't want to attend Sunday services, but they may still want to wander into a church and look around, and to sit and to meditate. People go into a church when they want to pray or if they only want a good cry. They won't necessarily come back on Sunday - although, of course, they might - but it is the church building itself which offers them a spiritual shelter. 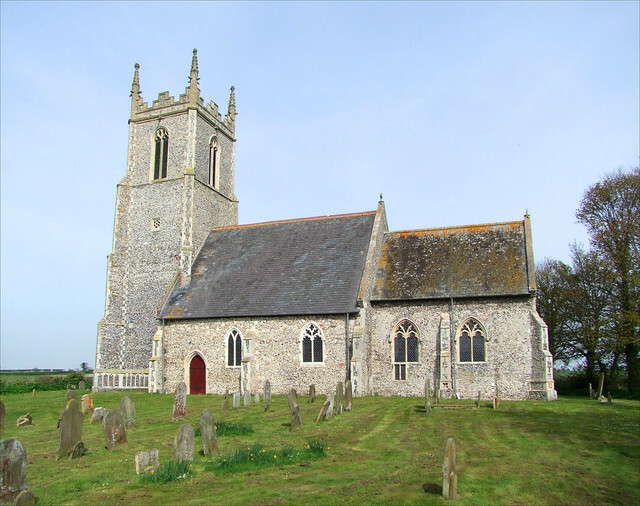 Be that as it may, the energetic people of Runham galvanised themselves and began a rolling programme of repairs, culminating in 2007 with the first wedding to take place at St Peter and St Paul for more than forty years. Today, a Church Open sign is proudly propped up beside the north doorway, and unlike Bill Wilson you can step once more into this ancient space. The first impression is that there is still much work to be done here; the walls, though sound, still await decoration, but the floors have been reset, and the chancel in particular is looking in fine fettle. I recalled that one of the plans put forward for the church in the early 1970s was that the chancel would remain in use but that the nave would have its roof removed. I'm glad that didn't happen. On the south wall is a 1790s memorial to Mrs Mary Price, wife of the Vicar of Ormesby, who was no doubt responsible for the inscription thou best of mothers and most beloved of women, farewell. It has done well to survive the years of vandalism and dereliction. The great curiosity here is the font, which has a reading desk set on the west side. I've not seen anything like this anywhere else in East Anglia, and although it is in the 14th Century style it surely cannot be from that period. Cautley took a look when he visited for what would become Norfolk Churches and their Treasures in the 1930s, and he observed that the surface of the stone is "dragged" and I cannot believe this font to be old. However, it is still of interest, and will no doubt make it into the next revision of Pevsner, when that happens in about 2030 or so. But Runham church is not in the new edition of Sam Mortlock's Guide to Norfolk Churches - he tells me that news of its restoration came too late, and the book had already gone to press. St Peter and St Paul is one of the great success stories of Norfolk churches so far this century, and a sign of the real difference ordinary people can make when they put their mind and energy to it. As I stood in the neatly cared for churchyard, the breeze bringing a taste of the sea as it blew in from the east, I was pleased to be here. commission helps cover the running costs of this site.